At Dovestone Park you can spend quality time with your family in the Peak district National Parks spectacular landscape. Here Reservoirs, Moors, gritstone edges and miles of hiking trails and paths are all here waiting for you to explore. Whatever the weather, everyday can be different giving you and your family the perfect opportunity to re connect and create your own perfect holiday experience. Why not gather your friends or family here together for that special occasion such as a birthday, anniversary or just a break together to catch up and enjoy good company. Or escape to Dovestone Park for a romantic getaway with the one you love. Take gentle walks through the peak district countryside and visit nearby villages and sample the local hospitality. Enjoy intimate alfresco dining and a Hot Tub under the stars, relax, spend quality time together and make the most of your romantic Break. The Peak district National Park offers a spectacular variety of scenery for walking and rambling routes – from limestone dales to dramatic high moorlands. There are walks to suit individuals, families and groups – whether you want a challenging hike or a short stroll. Whilst Dovestone Reservoir itself is a Popular location providing a circular walk of 2.5miles offering stunning views and giving access to two further reservoirs, Greenfield and Yeoman Hey to the north. There are a series of more than a dozen Audio Trails provided by www.moorsforthefuture.org.uk simply follow the link to ‘Audio Trails’. The two closest trails are Marsden Moor and Bleaklow. A trail where you follow in the footsteps of Mesolithic men and women. Imagine yourself 11,000 years back in time and then relate to more recent times, with Blind Jack of Knaresborough building the turnpike roads. Bleaklow is very much for the adventurous and experienced walker and is an enhanced audio experience (creative writing and actors used). The trail showcases the restoration work of the Moors for the Future partnership. A little further away you have the Audio Trails for Kinder and Edale. The adventurous walk that takes in the most famous landmark in the Peak District, with panoramic views from many points on the plateau. The Audio for the Edale walk includes expert interviews and music. Edale with its remote rural railway station is where the Pennine Way commences and where a substantial Tourist Information Centre is located. Take to the waters at one of the peak districts National reservoirs and you will find a great way to escape the hustle and bustle of daily life. Sailing Clubs operate from the nearby Dovestone Reservoir as well as Carsington, Rudyard, Combs, Errwood and Torside. Dovestone sailing club caters for novices through to the experienced sailor. Situated on the edge of Oldham and the Peak District National Park, Dove Stone Reservoir is a spectacular area popular with visitors and for family days out. Dovestone Lodge’s lie within an area of the Peak National Park known as Dark Peak which forms a globally important treasure trove of wildlife habitats. The Beautiful RSPB reserve of Dovestone is a bird watchers paradise where Skylarks, Meadow Pipits, Red Grouse, Curlew, Ring Ouzel, Merlin and Peregrine falcons can be spotted. A walk in these beautiful Moors and Gritstone Crags will find you amongst the flora and fauna of Cotton Grass, Bilberry and Cloudberry, whilst don’t forget to keep an eye out for Wild Red Deer and Mountain Hares. Curlew, Lesser Redpoll, Golden Plover, Goshawk, Peregrine and Red Grouse are amongst nearly 100 bird species making an appearance either seasonally or throughout the year. The reservoirs also form a home for many waterfowl and in some years Ospreys have been spotted. Dove Stone has some very special claims in the Funghi department including only the 3rd spotting in the UK of Arrhenia Peltigerina and the only slightly more common Skeletocutis Amorpha. The winter appearance of snow white Mountain Hares is something to make a special lookout for and is a sight not often seen. There are a great many wining and dining places in the vicinity, in the Peak District National Park and in urban situations, like the Chinese quarter in central Manchester. You have a range of experiences across Bistros, Cafes, Country Pubs, Ethnic and Fine Dining. The danger of listing any is that management and ownership can change, so an average venue becomes one of the best and another slips down in its standards. Locals are invariably a good source of very current guidance and review sites can also assist. A range of dining experiences including those with outside dining and close to tourist spots. A host of café and bistro venues that partly focus on the ‘Last of the Summer Wine’ heritage, including Sid’s Café. Plenty of different venues close to key tourist spots and some borrowing names from ‘Last of the Summer Wine’. There are many very good country pubs and tea rooms spread around the Peak District and you can sometimes encounter these in some unexpected remoter locations. The Pennine Way and other walking routes mean that venues can sometimes be in remoter spots but visited by a great many walkers etc. Greenfield station has regular trains running into central Manchester giving very wide dining and fine dining options. Remember though to be clear on last train times and variations at weekends, Bank holidays and from maintenance work. The wider area enjoys some significant retail opportunities across Manchester, Leeds and Sheffield (Meadowhall). Then you will find many local and often artisan or craft type shops nearby or further into the Peak District National Park. Meadowhall is the modern retail complex built on the outskirts of Sheffield and very visible from the M1 motorway. Further details at www.meadowhall.co.uk. The intu Trafford Centre is an extensive retail park at Manchester M17 www.intu.co.uk/traffordcentre. Manchester Arndale centre is an earlier build of retail centre opposite Selfridges and Harvey Nicholls. Further details at www.manchesterarndale.com. The Manchester Fort shopping centre has some 1200 car parking spaces and further details of the retail offer can be found at www.manchesterfort.co.uk. Leeds has a Victorian quarter and the Grand Arcade with retail opportunities and the Trinity facility with 120 shops/restaurants etc. Further details at www.trinityleeds.com. There are a host of smaller towns with different offerings, some of which are very much stone built traditional areas where you may find interesting delicatessen or other artisan type shops. Holmfirth and Saddleworth both have things to offer in this style or in eateries/restaurants. Travelling to Saddleworth from the lodges you pass on the right a large national chain supermarket and a few smaller shops en route. You will be overflowing with options for sport and activity participation across cycling, hill walking, rambling, rock climbing, sailing and many more besides. Cycling is a fun healthy way to explore the beautiful Countryside of the Peak district and there are many local Cycling Trails ideal for family cycling, whilst remote moorlands bridleways provide a challenge for experienced mountain bikers. Major Trails in the Peak district include The Longendale near Crowden which is a former railway line, and further to the South are Monsal, Tissington and high Peak Trails. You can bring your own bikes to Dovestone Park or hire them from a nearby hire centres and dedicated bike stands are provided at all lodges. The Peak District National Park estimate they have some 65 miles of off road trails on which horse riders are welcome. The bridleway network also offers possibilities for the more adventurous www.bridleways.co.uk. The experienced rider wanting a long distance trek will know of the 268 mile (431km) Pennine Bridleway across rugged mountain terrain. Within the Peak District you have some very popular climbing routes and also some of the most challenging in the UK. The Roaches in the Staffordshire Moorlands and Stanage Edge, closer to Sheffield, are of particular note. Nearby Chew Valley is a well known gritstone climbing area and Dean Rocks reach up to 460m. Training first on artificial rock climbing walls is now the obvious starting point for the sport. There are several Golf Courses around the Oldham area and further afield. A summer opening pitch and putt course can be found at Bishops Park. Various outdoor events use Brownhill Countryside Centre as a base so it is best to check what is currently available from a website www.oldham.gov.uk. In the football arena you have Premiership sides including Manchester City and Manchester United or a little further away Liverpool FC. Then there are a host of towns and cities with a strong soccer tradition such as Blackburn, Bolton, Burnley, Huddersfield, Leeds and Sheffield. Remembering also that the train from nearby Greenfield station, should get you to the centre of Manchester in around 30 minutes. First class cricket grounds include Old Trafford (Manchester) and Headingley (Leeds). You will typically have some Test Cricket at one of these venues every season. There is a very strong tradition of top Rugby League in the towns and cities around Dovestone including Bradford, Leeds, St Helens and Warrington as examples. You will not be lacking options for Great Days Out and just one example is the Heights of Abraham in Matlock where you will find attractions from cable cars to the various rides in the Hilltop Park. The Bronte’s have been described as the world’s most famous literary family with works including Jane Eyre, The Tenant of Wildfell Hall and Wuthering Heights. The family lived at Haworth Parsonage from 1820 to 1861 and this is now the museum (pictured). The museum has a world class collection of manuscripts and letters, with many of the rooms at the Parsonage retained as the Brontes would have known them. In 2016 the 200th anniversary of Charlotte Bronte’s birth will be celebrated. More details can be found at www.bronte.org.uk. There is a sizeable museum shop and Bronte related books are sold for both children and adult markets. The books include some less common titles.The former wool manufacturing village of Haworth is described as still recognisable to how it was in the Brontes era. There are a number of historic or other houses in or around the edge of the Peak District National Park and which have gardens/parkland. Gardens that open temporarily; can be connected with the National Gardens scheme or for charitable events. Chatsworth and Haddon Hall are in the vicinity of the southern or White Peak area of the National Park, an area more of rolling limestone hills and fields enclosed by dry stone walls. The northern Dark Peak area is associated with open moorland rather than gardens. Chatsworth www.chatsworth.org is a major Stately Home with some 20 gardeners and a still greater number of volunteer gardeners. Attractions include the Cottage, Rose and Kitchen gardens along with the 300 year old water cascade and the impressive gravity fed Emperor Fountain. There are some five miles of walks including streams, ponds and rare trees. Haddon Hall www.haddonhall.co.uk near Bakewell has been noted for its Elizabethan inspired knot garden on the Bowling Green Terrace. Whilst the Fountain Terrace was replanted by a Chelsea Award winner. The location is also known for its use in Film and TV including three versions of Jane Eyre along with The Other Boelyn Girl and a long list of other film and TV credits shown on the website. The Saddleworth Museum and Art Gallery is very close and some details are included at section 7 above. The museum is not large and the gallery rather small but it is a useful spot to call at, not least as it doubles as the Tourist Information Centre. The Tolson Museum and Ravensknowle Park is a museum in a substantial building, donated as a memorial to members of the Tolson family, who were killed in WW1. Orginally focused on Natural History it later had manufacturing exhibits added including vehicles made in the area and a Victorian School room. The Coln Valley Museum has a focus on textile history along with a children’s corner with some traditional toys. Wakefield is home to the Wakefield Museum and some 5 miles away from it the National Coal Mining Museum (‘NCMM’). At the NCMM there is the option (usually needs to be pre-booked) to descend some 140m underground with Miner’s lamps; allowing visitors to view the working conditions through the ages and coal seams. The Dewsbury Museum and Crow Nest Park focuses on local history of the area set in a mansion house within parkland. Ornamental lake, adventure playground and walled wildlife garden. Bradford is home to the National Media Museum with its focus on film, photography, TV and radio history. Whilst the Bradford Industrial Museum is in a former textile mill site with millworkers homes and factory machinery. A short hop over the moors takes you to the ‘Last of the Summer Wine’ country of Holmfirth, passing over the Pennine Way en route. The Tourist Information Centre is well signposted and is currently on the left, approaching from Greenfield/Dove Stone direction. 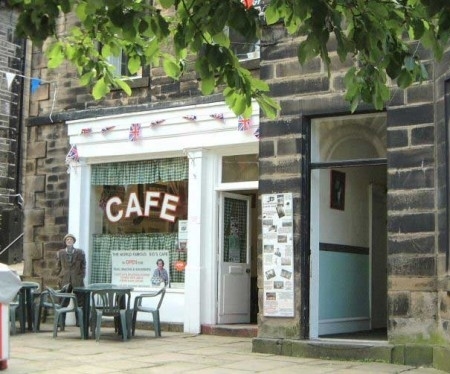 There are pay car parks signposted in Holmfirth and many eating places.Various museums and dining spots follow the ‘Last of the Summer Wine’ theme and there is the legendary ‘Sid’s Café’ used in the actual filming of the series. Dove Stone and more specifically the Greenfield estate is also known for media appearance in a well known ‘Bread’ advertisement.